Reduce the risk of earthquake induced damage with seismic retrofitting! The possibility of an earthquake is a reality for Southern California residents. That’s why it’s important to make sure your home is properly reinforced to resist seismic forces. Homes built before 1985 are especially vulnerable to earthquake damage. But buildings of all ages and styles can benefit from reinforcement with approved structural connectors and other structural reinforcement. The seismic retrofitting process involves the installation of engineered metal connectors and other reinforcement materials at key stress points throughout your home’s structure. The specially designed hardware includes hold downs, anchor & anchor bolts, strap ties and framing angles. Wood blocking and structural sheathing may also be incorporated into many retrofitting packages. 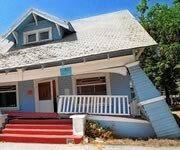 The goal of the retrofitting process is to counteract three main earthquake-induced forces that can cause major damage to a building: racking, sliding and overturning. In engineer-speak, the retrofitting process transforms a building with loosely connected parts into a unified structure with a ‘continuous load path’ that extends from the building foundation up through the walls and all the way to the roof framing. Cripple wall bracing: Many structures are built on cripple walls. 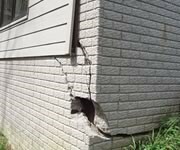 Cripple walls are short walls that rest on a home’s foundation and support the floor and exterior walls. When these walls are not braced, they may shift during an earthquake. When this occurs, the probability of severe damage and injury to individuals in the home greatly increase. Bracing cripple walls strengthens structures by increasing stability and the process typically helps minimize damage on homes. Foundation bolting: Houses that aren’t bolted to their foundation may move during an earthquake. Homes that move off their foundation may also cause gas lines to rupture, which may lead to fires. The bolting process requires that holes are drilled into the sill plate on a foundation and anchor bolts are installed. Sometimes, there isn’t enough space to drill, and steel plates will also need to be attached. Anchoring to mud sill: The wood on top of the foundation of a home is called the mud sill. Prior to the 1950’s mud sills were not bolted to a home’s foundation. This creates a huge structural weakness in a building. The home can slide off its foundation during an earthquake. Homes should be anchored to the mud sill, which requires bolts or special plates to be placed every 6 feet. The cost typically runs from $4,000 to $10,000 depending upon the size of the home, the accessibility to the foundation, and the type of work required (cripple wall bracing, foundation bolting, anchoring). One must consider this cost vs. the cost of rebuilding or repairing to the home once an earthquake has ripped the home off its foundation. Seismic retrofitting is smart because…….. Proper installation of seismic hardware will help minimize earthquake damage, reducing home repair costs following s seismic event. Whenever I speak to homeowners about remodeling their homes, I always approach the issues as if their home were my home. And as for my own home, when I bought it the first thing I did was to retrofit it. The last thing I wanted to have happen was to lose my home, my equity, my family when the next earthquake hit. And we all know that is to going to happen here in Southern California! For a free inspection and estimate with regards to Seismic Retrofitting, please send me an email (davidkeeton68@gmail.com) and I shall be pleased to make an appointment with you in the very near future. There are currently no comments for SEISMIC RETROFITTING in SOUTHERN CALIFORNIA.